Carmel, Indiana is a vibrant suburban city that is located on the North Side of Indianapolis. Carmel offers its residents everything - outstanding schools, low taxes, safe architecturally diverse neighborhoods, and an easy commute to larger cities. The Indiana pest control professionals here at Action Pest Control have the services needed to keep properties located in Carmel free of the many insects, rodents, and other pests that call Carmel home. Our dedicated professionals provide pest control services that are discreet, effective, modern, and environmentally friendly. Count on Action Pest Control to ensure that your Carmel home or business is always free of common Indiana pests! Your home is your sanctuary, a place where you should be able to come to after a hard day and rejuvenate. However, if pests like ants, spiders, mice, termites, or others have invaded your Carmel home, it can quickly become a source of stress instead of a place to enjoy with your family. The best way to protect your home, your family, and your sanity from the dangers and damages of pests is to put in place a year-round pest control service. Year-round pest control is the best way to get rid of the current pests that have made their way into your home and to ensure that future pest issues don’t happen! At Action Pest Control, we offer our customers 4 different options when it comes to year-round pest control. You can be sure that all of our year-round residential pest control programs offer effective pest management solutions that are always provided by our highly trained and experienced technicians, and always at your convenience! Essential pest control - This is our basic program and provides customers with exceptional exterior pest defense services and cobweb removal. Advanced pest control - This program offers customers both exterior pest defense and interior pest treatments. It also includes cobweb removal, window sill vacuuming, placement of exterior rodent stations, rodent control services, as needed pest proofing, unlimited services calls, and services that are fully guaranteed. Complete pest control - This Complete pest control program includes everything that is found in the above Advanced pest control program, but also includes an annual attic inspection, termite monitoring services, and a termite inspection. Premier pest control - The Premier program is our most inclusive program and provides the most cohesive protection for your home against a wide variety of household pests. In addition to all the services that are provided in the Complete pest control program, the Premier program provides termite treatment and a termite warranty. Action Pest Control provides customized pest control solutions to meet your facilities specific needs. Our trained and certified pest professionals can provide exceptional pest protection for any commercial facility; and they are always supported by supervisors, managers, and board certified entomologists who frequently inspect each account to ensure that you are always receiving the highest level of service. 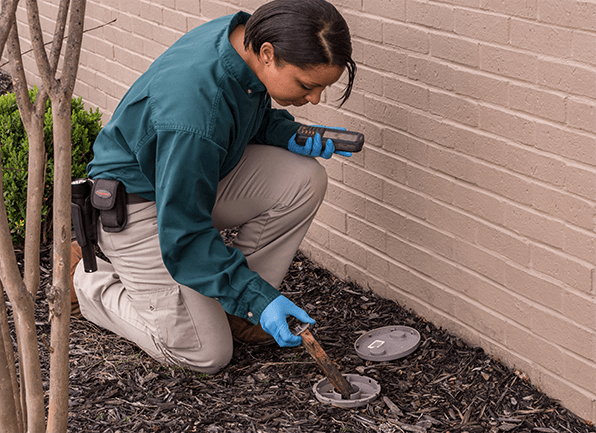 Our commercial pest management program includes the following: inspection, monitoring, identification, sanitation, exclusion, harborage reduction mechanical controls (traps), environmental control, product application, and documentation. Protecting your Carmel commercial property from the damages and dangers that a pest invasion can cause is vital to helping ensure that your business’s reputation remains positive within the community! Bed bugs are still an issue for homes and businesses all across the country, and unfortunately, they are an issue for homes and businesses in Indiana as well. Bed bugs are often unknowingly introduced into properties after people accidentally come in contact with them while out and about in a public place like a hotel, library, movie theater, or airport. It is important to remember that a bed bug infestation can happen in any home or business and help should be sought as soon as signs of bed bugs are noticed. The actual adults - they are reddish-brown; have a flat, oval shape; and have six legs. Tiny droplets of blood found on linens, mattresses, and box springs; these droplets are left as the bed bugs feed or if they are accidentally squished. Black flecks (bed bug excrement) on linens, mattresses, and box springs. Piles of their molted skins underneath pillows, mattresses, and box springs. In the case of a large infestation, you may notice a musty smell in the air of an otherwise clean room. If you notice signs of bed bugs immediately contact the bed bug experts at Action Pest Control. One of our bed bug dog detection teams will thoroughly inspect your property, and if bed bug activity is found, we can quickly provide treatment through our heat remediation services. Call us today to learn more about bed bugs and how Action can eliminate them from any Carmel property! Action Pest Control should be your choice for pest control because we are a company that has worked hard to gain the trust of all of the communities that we serve. We always provide all of our customers with modern, effective, and eco-friendly pest control services. At Action Pest Control, we put our customers first by providing guaranteed 24-hour emergency service response, the convenience of online payment options, and by offering superior communication, including written service specifications. Action Pest Control is a QualityPro certified company and all of our professionals and pest control programs are overseen by our on-staff board entomologists. Our professionals are friendly, dedicated, highly trained, and state certified. Contact us today and allow us to begin protecting your Carmel, Indiana, home or business from pests through our innovative and customizable pest control services!